Your Garden Extra Chic with an Industrial Fence! Genuine designers and gardeners know their spaces are never finished for good. They are a constant work in progress. Let Boundary Fence in Denver continue that progress in your space. We have everything you need for fencing and gates from residential to commercial. If you think outside the box, you can create a unique juxtaposition for your garden providing a personal space that speaks of your own style. 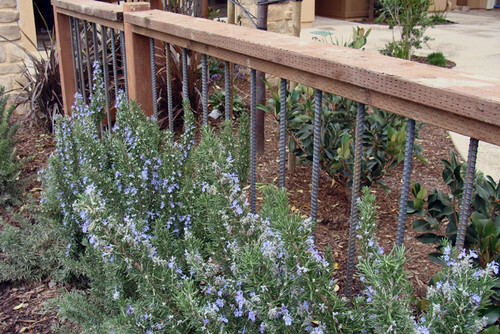 Think of using ornamental steel, wrought iron, galvanized wire, or even rebar in your garden! Industrial type materials bring an element of the unexpected to a garden. We will show you a few ideas for your garden, and if you like the design, we can supply it! How about adding a railing or baluster in your garden? Think of adding an additional element of industrialized steel to incorporate a bit of a modern or rustic touch to your space. The photo above shows rebar used an ordinary handrail providing a cutting edge rustic vibe. Rebar is short of reinforcing bar, a steel bar manufactured for use in concrete. 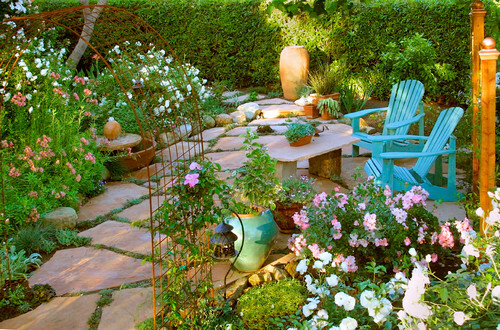 When exposed to the elements, it begins to rust, which adds to the charm of a rustic garden. Arbors can be added to any garden or yard space for an instant charm appeal. Arbors typically are made from wood, however, what if you have one constructed from wire for an eclectic whimsical garden design? Grow vines at the base or even a weeping tree next to it. Rose bushes intertwined in the rustic arbor would be picture perfect for any garden space. Traditional Landscape by Spokane Landscape Architects & Landscape Designers TERRABELLA, inc.
Industrial accents can also be added to walls surrounding the garden, or the side of a house or garage. 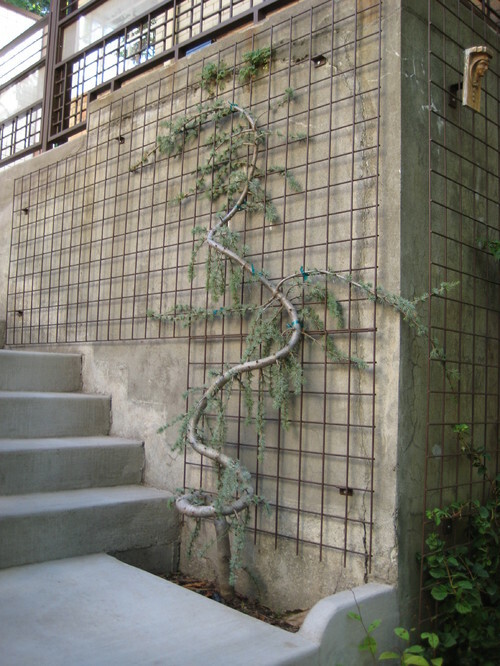 In the photo above, you see sections of wire purposed as a trellis for a serpentine vine. The vine adds to the geometry of the space, adding a visual softness to the look. This works especially well with concrete or a wood backdrop. Create Your Own Unique Gate or Fence with Boundary Fence and Supply Company in Denver! With our wide variety of supplies in cedar, galvanized wire, vinyl, steel, iron, and many others, you can create any fence or gate for your garden. Why be ordinary when you can be unique and spectacular? We will work with you to create a fence or gate perfectly suited to your needs. All our gates come in standard sizes, however, we custom build made to fit gates. Boundary Fence in Denver has over 42 years of experience in Denver, our customers can depend on the quality of supplies and business integrity. We set the standard in residential, commercial, and industrial fencing. We look forward to serving you and meeting all your fencing needs!